Yuri Yakovich, who previously authored an incredible book on the sveshnikov sicilian for Gambit as well, has produced a fantastic little book here, which I highly recommend for the following reasons: First of all, the book is not a massive treatise that requires months of your time, but instead is on a nice playable sideline, although the reader has to be prepared to play a saemisch nimzo-indian when adopting this move order, the theory of 4.f3 is not overwhelming, as it may be in the 4.e3 (Rubinstein) or the 4.Qc2 (Capablanca) Nimzo-Indian systems. Here, in less than one hundred pages, Yuri Yakovich gives a nice overview of this system, covering at least two options for white in all lines, and offering thematic, recurring ideas along the way, which gives the reader an intuitive feel for the positions very quickly. Yuri follows with a number of instructive games in the “Illustrative games” section, which rounds the book off nicely to 125 pages. It is easily possible for the reader to digest the material in this book in an afternoon and start playing this system with confidence immediately. I love concise opening books that give me that ability- simon william’s text on the classical dutch comes to mind as another example- and I plan on adding this system to my repertoire as white. There are principally only four options that white will likely face from black after playing 4. f3 : Nc6, 0-0, c5, and d5. 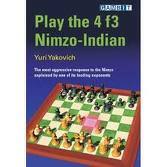 Yuri covers the first three very quickly, but fairly, while spending most of the book on the move 4…d5. As a reader who wants to quickly understand the concepts behind the opening and work out the details through some testing blitz games, I like that I can learn a few simple continuations and cut down the focus to a single response – 4…d5. Obviously the benefit of playing a nice sideline like this is cutting down on theory. I’m not sure if there is any surprise value in the move 4.f3, since the resulting positions tend to be the kind of positions most nimzo players will feel comfortable with, and it often transposes into a saemisch nimzo indian after white plays a3, putting the question to the bishop. Ultimately, I am recommending the book because it is well written, concise, and gives good coverage of a solid yet dynamic answer to the nimzo indian. To bolster the timeliness of this variation, this game occurred just this summer at the shanghai masters.